The Jaycees float in a 70s parade. Heritage Holidays in Historic Edgefield are just around the corner! The Mayor’s Office says to save the date for Sunday, December 8, for the 40th Annual Edgefield Christmas Parade! The Grand Marshals for this year’s parade will be the former Edgefield Jaycees and Jaycee-ettes of 1973 and up. 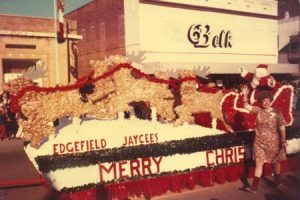 They were the founders of the Edgefield Christmas Parade. Parade day will begin with entertainment on the Edgefield Town Square beginning at 1:00 p.m. and end at 4:00 p.m. — just in time for the parade. Parade applications are available at Edgefield, Johnston and Trenton Town Halls and at www.edgefieldsc.net. Citizens are invited to bring family, friends and chairs and enjoy a day of old fashion Christmas Spirit in Downtown Edgefield. For more information call Calvin Henderson at 803-480-1255 or Edgefield Town Hall at 803-637-4014.